How important is same-day delivery to shoppers? It’s of some importance in certain product categories, and to younger shoppers. As the competition for faster shipping intensifies and UPS and FedEx raise their rates, e-retailers are challenged to provide quick yet cost-effective delivery solutions. Naturally, this leads to some questions. How important is same-day delivery to shoppers? And how much are they willing to pay for it? Our latest Bizrate Insights survey gives some answers, including some interesting insights by generation. 19% of buyers surveyed say that same-day delivery is “important” and 4% have considered not purchasing an item because same-day delivery wasn’t offered. The percentage of buyers who found same-day delivery “important” went down 5 percentage points from 24% in 2013; however this drop may be due, in part, to a changing delivery landscape. A significantly larger percentage of shoppers have since joined shipping clubs, such as Amazon Prime or Wal-Mart’s ShippingPass, which means consumers may be more used to two-day or three-day delivery. Furthermore, one-hour delivery has also become available in some markets, so shoppers who require an item immediately may spring for one-hour shipping instead of same-day. The desire for one-hour delivery remains small yet noteworthy, with 9% of buyers finding one-hour delivery “important.” 3% of online buyers had considered abandoning because one-hour delivery wasn’t available. 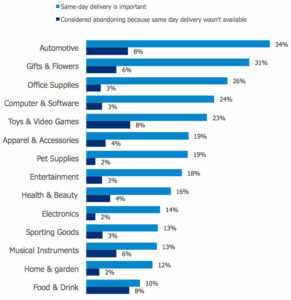 On an industry level, same-day delivery is most important to buyers in the Automotive and Flower categories, while a notable percentage of shoppers (8%) considered abandoning because same-day delivery wasn’t available for Toys & Video Games, Automotive and Food & Drink purchases. 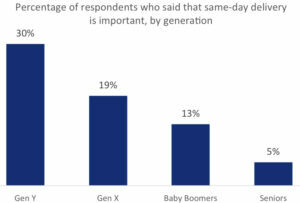 When it comes to the importance of same-day delivery by generation, there is a clear decrease in importance as shoppers get older; nearly a third (30%) of Millennials find same-day shipping important, while only 5% of Seniors do. While the retail industry buzzes about faster delivery options, shoppers continue to prioritize one concern above speed: shipping cost. Delivery cost is more important to 74% of buyers, versus delivery timing (important to 26%). This deep concern over cost remains relatively unchanged since 2013. 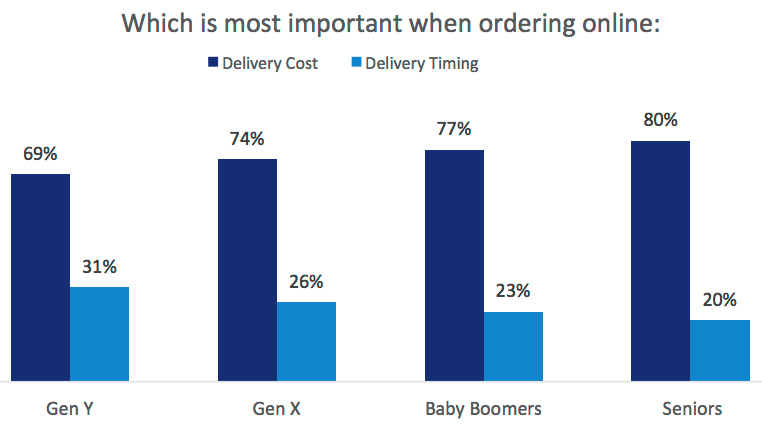 Breaking down time vs. cost preferences by generation reveals an interesting disparity: although all generations care more about delivery cost than timing, Millennials care less about shipping cost—and more about timing—than older generations do. Cost becomes increasingly important to older generations, while concern about timing decreases. So how much are customers willing to pay? On average, buyers expect to pay about $15.78 for same-day delivery, but their expectations vary significantly by category. Customers expect to pay as much as $24.18 on average for same-day delivery of Automotive items, but as little as $10.55 for Pet Supplies. 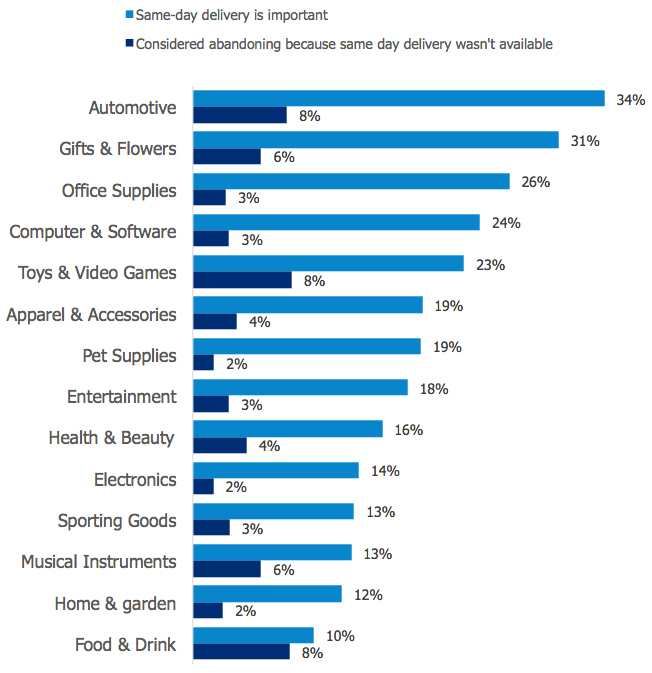 How Many Shoppers Use Same-Day Delivery Today? Of the online buyers surveyed, 10% said they have used same-day delivery (outside of meal delivery) in the last 12 months. Only 5% of online buyers have used same-day delivery in the past 12 months because they needed the item right away (rather than simply trying same-day delivery out, or using it because it was free). Therefore I’d caution retailers who are pondering same-day delivery to consider the category of products they sell, the importance that their customer base puts on this service and the cost that their customer base is willing to pay. While same-day delivery can be helpful for shoppers in a pinch—particularly to Millennials—delivery cost remains the primary concern for all shoppers. But if you checked all of the boxes and believe that same-day delivery is right for your business, then I’d recommend partnering with a declared third-party who will bear the weight of the cost, margins and top-notch service. This report includes data from 6,767 online buyers in the US and Canada from October 27-30, 2015. The data was collected via online survey presented immediately after completing a purchase from over 5,000 ecommerce retailers in the Bizrate Insights Network. Retailer participation in the Bizrate Insights Network is free.